Perhaps this post would more aptly be named ‘My Dad is full of Beans.’ Keep reading to find out why! Look at this gorgeous jar of beans my parents brought when they came to visit for Thanksgiving! Don’t you just love the colors?! 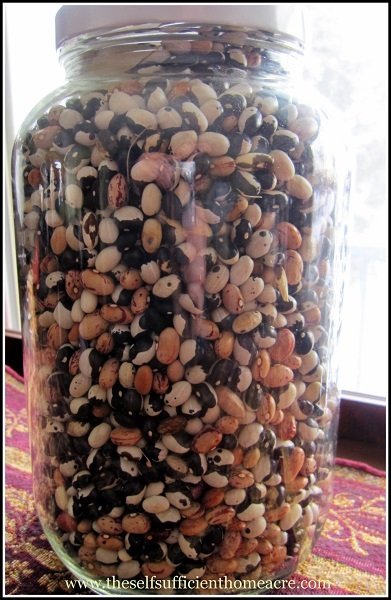 There is a little bit of a story behind this jar of beans and it involves my Dad. My Dad loves beans…baked beans, ham & bean soup, green beans, beans in chili, yellow wax beans, any kind of beans…he loves them. My Mom likes beans too, but she can only eat them as green beans. She never did like the yellow wax type, don’t ask me why. Anyway, my Dad plants a gazillion beans every year. My Mom just shakes her head and smiles. You would think that my Dad was feeding an army with the size of his garden. It gives him great pleasure to show up on a friend’s doorstep with a bushel or two of produce. It was the same when I was a kid. I remember picking row after row of beans…until my back ached and I was sunburned. At least that’s how it seemed back then. We went to visit my parents last May to celebrate their 50th anniversary. We had a grand party with way too much food and a bunch of friends and relatives I hadn’t seen since I was knee high to a grasshopper. It was great! But my Dad’s back was out of sorts the whole visit. Mom insisted that it was because he unloaded several trailers full of horse manure from the neighbor’s stable into the garden with a pitchfork. Dad pee-shawed that whole idea and said it never bothered him before. Well, when my Mom was in the other room, he admitted that he probably over did it, just a little bit. After the party was over and the dust settled, I asked Dad if I could help him plant his garden. It was all plowed up and he had some peas and one row of beans planted, but that was about it. I bought Brussels sprouts, tomato, hot pepper, and sweet pepper plants and dragged them down to the garden. My cousin Jace showed up and helped plant. It was great to visit with him and talk gardening, bees, chickens, trapping…anything homestead related, Jace is into it. We got the garden whipped into shape in no time and I thought we were done. The view from my parents back porch. But my Dad showed up with his seed planter and a grocery bag in his hand. He wanted more beans! Well, I’ll be darned if I was going to tell my Dad he was nuts. 🙂 So I planted beans, beans, and more beans. There was a kaleidoscope of colors all mixed together. These were beans that Dad has grown in the past and then saved in the fall. Black Turtle beans, Dwarf Horticultural beans, something French that I can’t remember, Calypso beans, beans that he had forgotten the names of…in the back of my mind I could see my Mom shaking her head. 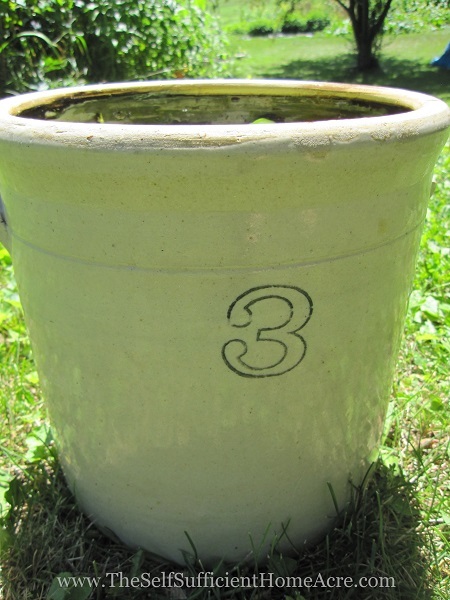 Antique seed planter just like the one I used to plant beans in my Dad’s garden. Well, the beans were planted. My back was starting to feel like taking a break well before my Dad finally stood up, surveyed the garden, and said “That looks like enough for now.” For now? I imagined him back out there the next day putting in another 3 or 4 rows, but I wasn’t going to argue with him. He didn’t plant anymore beans before we left for home, but I’m pretty sure he did plant more about a week or so later. We had a wonderful visit, and you can read more about it here. My family made the 600 mile drive back to Illinois to our own garden and homestead. Everything was in fine shape thanks to our friends and neighbors who chicken sat and watered the garden for me. Summer burned away with the worst drought I’ve seen since we moved here. I watered and harvested away the summer and fall. I butchered 15 turkeys and put them in the freezer…with some for friends and a nice fat one for a special Thanksgiving with my parents. They made the trip from western New York in two days, with a stop at Lehman’s Country store and another at Smucker’s Jams. Whenever they come to visit there are lots of goodies to unpack from their van. This time they brought an old crock that I want to use for making pickles next summer, two gorgeous pink pumpkins, Brussels sprouts, birthday presents, Christmas presents, jam, jelly, hot pepper jelly, and lots of beans! My Mom said this gallon jar was one of about 7 or 8 that Dad had harvested, dried, winnowed and stored for winter. 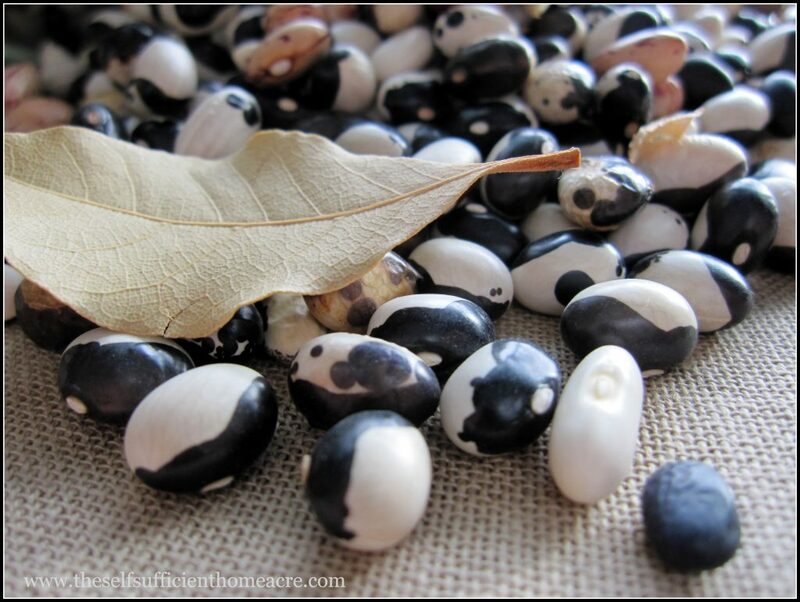 When my parents left I planted a seed in my Dad’s head…Scarlet Runner beans! Much to my Mom’s chagrin, I sent Dad home with a small bag of seeds I had saved from my Scarlet Runner beans last summer. He was intrigued by the fact that the little red flowers attract hummingbirds and the plants vine up a support like other pole beans. I think he liked the idea of not having to bend over to pick them. 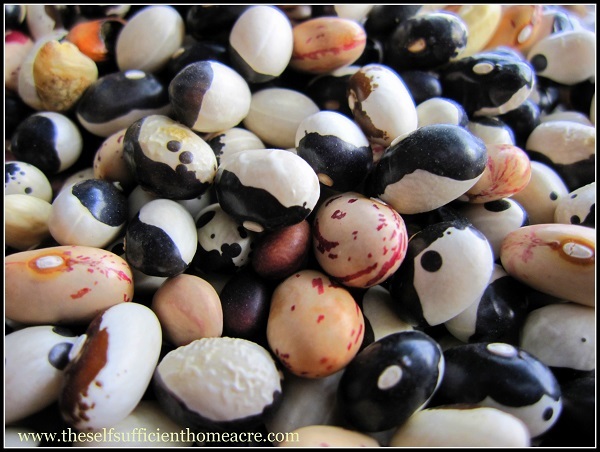 The beans are larger than most dried beans and have a nice mottled red and black pattern. I felt a little like I was offering a glass of whiskey to an alcoholic…I’m such a bad influence. I guess you can see where I get my gardening genes from. My handsome Pappy…aka, the bean addict. Way back in the distance you can see my Grandparent’s barn. It belongs to my Uncle Dean now that Gram and Gramp have passed. Do you grow your own beans for dying? What is your favorite way to eat them? Congratulations on being featured on the Saturday Round Up! I hope you’ll consider joining us this weekend too! The beans are beautiful! Thank you for sharing on the Saturday Round Up!! Thanks for inviting me Sara! Every time I visit your blog I learn something new and awesome! Those beans are just GORGEOUS! Thanks for linking up. Hope you have a great day and come back later today for this week’s new linkup! Thank you so much Sarah! I’m honored to hear that from someone as knowledgeable as you 🙂 Thanks for stopping by! I really enjoyed this post! We were just discussing that we need to plant a lot more beans this year as they are a great source of protein and give such energy for eating a small amount. By the way your beans and pictures in this post are just beautiful! Thanks so much for linking up this week to “The Ole’ Saturday Homesteading Trading Post!”! I can tell your parents taught you a lot about being self sufficient…what a gift! i am going to try to plant some beans this yr. different than the usual. speaking of pumpkins, ive found some that are a pastel pink and also a pastel blue. they are BEAUTIFUL. can be found on amazon .. supplier is…. my seeds. they are gorgeous. what a lovely farm. so envious but someday…. Best wishes with your beans this year! The pumpkins sound gorgeous. 🙂 I shaved some seeds from the pumpkins my parents brought and I’m going to try planting them to see if they come true to seed. 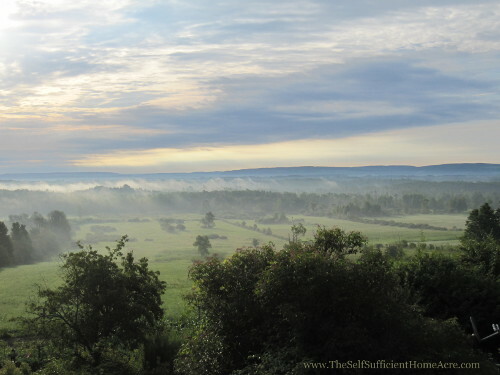 I was very blessed to grow up in that beautiful area of western NY, looking out over the valley everyday! I hope to move back someday. I hope you find a nice place like that too. 🙂 Thanks for stopping by and leaving a comment! Happy Anniversary! I hear that you just celebrated recently and wanted to congratulate you on this wonderful milestone in your marriage! It’s funny how much our tastes change over the years. I used to hate ketchup, peas, and summer squash. I hated ketchup because my sister told me it was made out of blood. 🙂 Silly me for believing her! I really can’t think of any vegetable that I truly dislike now. The view from your parent’s house is to die for! This will be the first year I plant beans for drying, so be sure to post about how to dry them when the time comes. It’s so nice to read about a close and loving family! Thanks for sharing this info Walt! I remember Dad fussing a bit when I talked to him on the phone because there was rain in the forecast. 🙂 It’s always something! So glad to have you visit my blog 🙂 You are lucky to be so close to my Dad’s garden! I sure do miss it 🙂 It’s great that he had produce to share with you this summer…proof I’m not making all this up! Say hi to Althea and come back often! The Succotash sounds yummy…let me know if you have a special recipe. Have you teased my Dad yet about being famous on the internet? What a wonderful post. Thank you. We have saved some bean seeds but so far they haven’t really come up (ok, last year some came up but the deer ate them!). This year I have a bunch that I saved and we cannot wait to plant them. 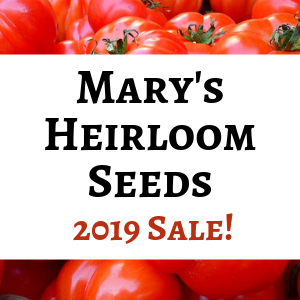 The seed saving aspect is wonderful because so many people don’t that it is a good reminder to those of us who try that there are those out there who are obviously succeeding and we shoud just keep on trying. Thank again. We do not yet grow beans for drying. Up until now we’ve not had the space but I expect we will be doing that in the near future. We stretch our budget by eating beans once, sometimes twice a week. I do plan to put in Scarlet Runners this summer. I love that I can plant them late (June) after my peas and they do just fine. Dried, they are beautiful. What a great blog entry! Those beans look delicious – but almost too pretty to eat! And by the way – I want to go sit on that back porch with your dad – it looks like a beautiful place to relax after working in that garden all day! This was a truly wonderful story of your father. I was marveling over the black and white beans. Those should be called pinto beans! They also remind me of little Shamus. I would love to learn how to grow my own beans. Perhaps next year. Those black and white beans are the Calypso beans my Dad saved. They are very attractive and you’re right, they look more like pintos than pinto beans! The dried beans are as easy to grow as green beans. In fact you can use them as both, just leave some of your green beans to mature on the plant until a light frost. Pick, dry, shell and store! Thanks Mindy 🙂 That’s the view I grew up with…and I loved it! Super story! 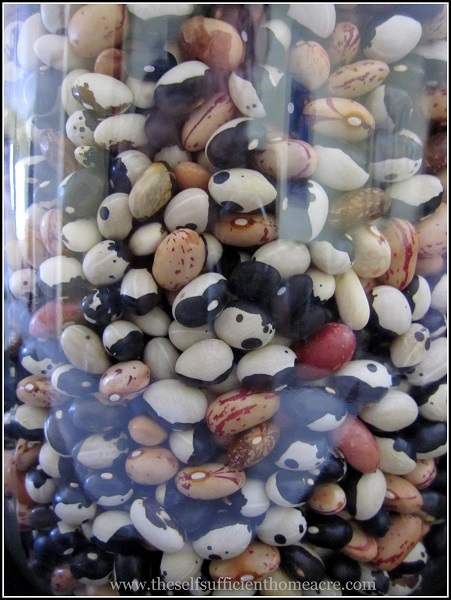 Loved everything about it, family…pics…the beans (you and your dad have inspired me to grow more..ha ha…and more varieties! ), great tips and I love the relationship you have with your parents…it’s a wonderful ting to see, it comes through your post loud and clear! Here’s to MORE beans! Thanks Kat! Glad we could provide a little inspiration. 🙂 I do have a great relationship with my parents…I’m so blessed! Great story! 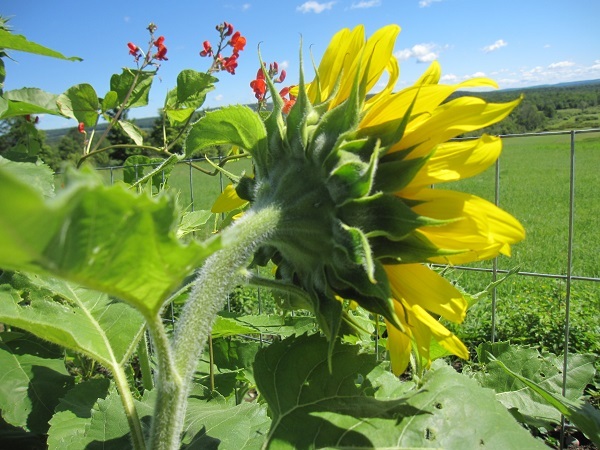 Western NY truly is a good place to plant beans–and how wonderful that your dad saves them to plant year after year. I learned about putting bay leaves in the jars, too. Thank you! Thank you Meredith 🙂 My Dad is a pretty cool guy!